Christmas wreaths on the front door are a must-have over the festive period – and if you find one that suits your home, it can really set the scene perfectly. 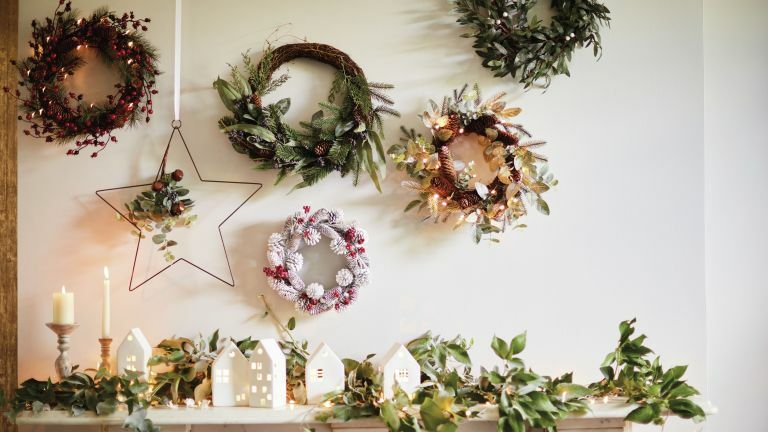 From traditional green foliage to something slightly more statement, we’ve rounded up the top Christmas wreaths to ensure your door is the best dressed this season. Want to make your own Christmas wreath? Our step-by-step will show you how. Deep green, fresh red berries and plenty of pine cones – what more could you want from this M&S traditional Christmas wreath? Oh actually, come to think of it, a little tap that dispenses mulled wine as you close the door would also be lovely. Candles, cosy blankets and ton of evergreen, Scandi style was literally made for Christmas. And while we love turning our places into the Norwegian cottage of our Pinterest dreams, why not try balancing out all that hygge with some metallic accents in the form of this beautifully simple gold wreath from Georg Jensen? We are loving the technicolour, slightly kitsch, stick anything on a string and call it a bauble trend that's going on this Christmas. This Rainbow Bauble wreath from John Lewis and Partners is definitely in keeping with that vibe and will make for a dazzling welcome. Love this look? Check out our pick of the best gloriously kitsch Christmas decorations. If you can’t bear to disturb your all neutral interiors with an evergreen wreath (don’t worry, we feel you) then this contemporary white metal wreath from The White Company is perfect. The handmade design is made up of embossed leaves and flowers which are then each dipped in matt white paint. Dreamy. Love them or loathe them, this ring of paper Brussel sprouts from Graham & Green does make a gloriously green alternative to your more traditional wreath (plus it's a great way to incorporate them into the festive season without actually having to eat them). Because if you can’t put up a huge peacock feather wreath at Christmas then when can you? This majestic number from Gisela Graham is a very glamorous alternative to an evergreen wreath, and while we wouldn’t recommend banishing it to the front door, this would look gorgeous on a mantlepiece or hung on a inside door. Deconstructed, minimal and gorgeously rustic we think that half wreaths might be the only way we are doing wreaths this year. You can of course make your own, it’s super easy and really affordable but if you want something you can bring out each year, this frosted eucalyptus number from Lights4fun is as far as you need to look. We have heard murmurings that you can actually make these things yourself, like go into the garden and pick twigs and leaves and what not. As lovely and festive as that sounds, if you don’t conveniently live next to Narnia, getting your hands on more than some wispy ivy may be challenging. But fear not, the Crafty Christmas box (deliverable from 3rd December) from Bloom and Wild contains all the festive foliage to create a gorgeous wreath, centrepiece or garland. And if all that sounds like too much, but you still want to get that divine Christmassy smell of a real wreath, the people at Bramble & Wild can deliver a gorgeous, luscious, handmade wreath right to your door. No one need know you didn't slave away making it yourself. Succulent wreaths are huge this year, so why not swap spruce for sedums with this incredibly realistic Emerald Frosted Succulent Wreath from John Lewis and Partners? It may be a more contemporary style, but features sprigs of evergreen and frosted pine cones so it still has plenty of festive feels. If you want to have a go at crafting your own wreath instead check out our guide to making a succulent wreath. Ikea have got some wonderfully quirky wreaths this year, but this has got to be our favourite of their offerings. The Strala wreath is battery operated so you can hang this light up ring of festive doves (at least we think they are doves) wherever you please. Probably not suitable for outdoor use, but hang this delightful Anthropologie wreath on an inside door or above a fireplace in all its festive glory. Oh and yes, before you ask, we definitely think you could get away with leaving this up all year round! This Matalan metallic wreath is the perfect balance between all out glitter ball and a more traditional vibe – sure it's glitzy but the natural pale wood keeps it from becoming tacky. While we of course love the traditional smell of pine and fir at Christmas, this wreath from Bloom & Wild, takes festive scents to the next level. Not only do the vivid dried limes and bright lavender look gorgeous amongst the evergreen, the aroma they give off will fill your hallway each time you open the door. What else would you expect from the quirky interiors emporium Rockett St George? This mirror ball wreath is truly fabulous and it's sure to make your door the talk of the street! So you got yourself Lidl's bargain Christmas tree, but did you know they are also selling insanely cheap, real fir wreaths? For just £4.99 you can pick up a simple, unadorned wreath and just jazz it up a bit yourself. If you are in need of some inspiration just check out our tips and tricks for decking out your home with festive foliage.